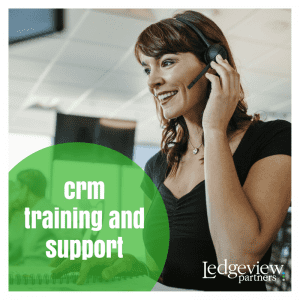 Whether this is your first step into the world of CRM, or you are a seasoned CRM veteran, Ledgeview Partners can be your guide from the start, help you when you are stuck in the middle, or get you back on track when you are completely lost. From CRM strategy, planning, and design, to implementation, training, and support, we have the certified expertise on our team so you don’t have to. What CRM Challenges Can We Help You Solve? We know just the idea of implementing CRM, or revitalizing CRM into your business can seem daunting. So, instead of jumping head first into CRM, we encourage you to share your business goals and challenges with us. Do any of these common challenges sound familiar? Unsure which CRM is the right fit for your organization? Using multiple, disconnected systems and need consolidation? Misalignment of departments or poor communication? Low user adoption due to lack of training or support? Inefficient processes or technology resulting in wasted hours and lower productivity? Several versions behind in Microsoft Dynamics CRM? Data issues! No mapping, cleanliness, or data integrity? Achieving CRM success doesn’t happen by accident. It’s the combination of a carefully crafted strategy and detailed planning. 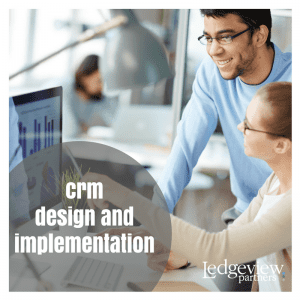 Ledgeview’s strategic analysis services focus on your business needs and goals and provide you with a clear definition of success metrics that will help you get from your current state to desired future state using CRM and connected technologies. Your business is unique and CRM “Out-of-the-Box” is not a one size fits all solution. 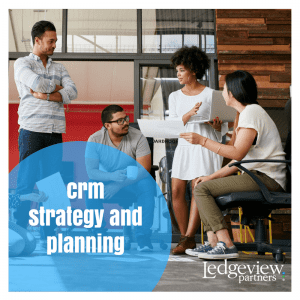 Building on your CRM strategy and planning analysis, Ledgeview’s certified experts design a system blueprint that contains both functional and technical business requirements to deliver an on-target, on-budget, and on-date implementation. This goes for upgrades as well. With all the new enhancements that are rolled out each year, it is critical for user adoption to ensure for a smooth transition for each new release. In order to achieve the greatest return on investment for your CRM solution, it is critical to have a high level of user adoption. Not all organizations have the resources (time, personnel, and/or knowledge) to provide end users and administrators the support, training, and coaching they require to utilize CRM to its fullest potential when it is needed. What is it like to work with Ledgeview Partners? We have a lot of case studies because we have a lot of happy customers. >> Read our CRM Consulting Case Studies and see for yourself.